The new version of Rad Studio include a very nice feature called VCL Styles, this functionality allows you to apply a skin (theme) to any VCL Form application. So in this post I will show you the basics about how load in runtime an embedded style or read the style file directly from the disk. besides as how you can easily create a new style. 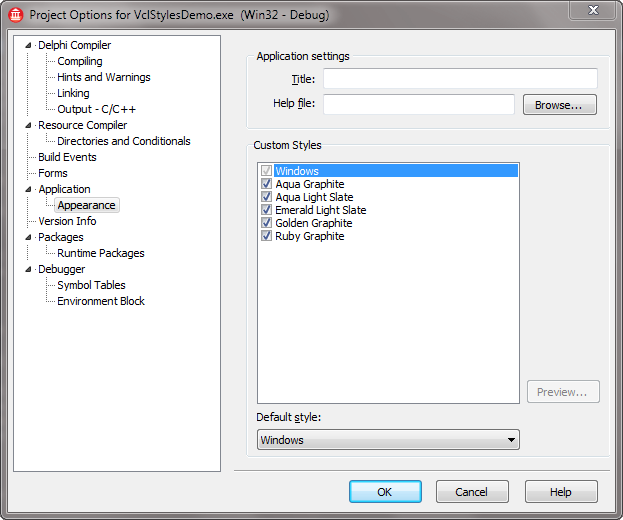 You can add a VCL Style to your application directly from the Delphi IDE menu entry Project-> Options -> Application -> Appearance Selecting the styles which you want to include in your Application and choosing a default style to apply. 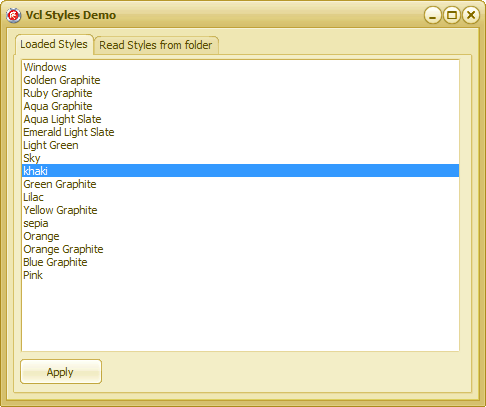 when you select a style, this is stored in the exe as a resource of the type VCLSTYLE with a 80 kb size approx by style. In order to work with the VCL Styles you must use the TStyleManager class located in the Themes unit and include the Vcl.Styles unit to enable the VCL styles support. To load (register) a VCL Style from a File you must use the LoadFromFile function of the TStyleManager class. TStyleManager.LoadFromFile(StyleFileName); //beware in this line you are only loading and registering a VCL Style and not setting as the current style. TStyleManager.LoadFromResource(HInstance, StyleResource); //beware in this line you are only loading and registering a VCL Style and not setting as the current style. To set in Runtime an already loaded (registered) style you must use the SetStyle(or TrySetStyle) procedure. The main element is the image under the images category, which define how the control will be drawn, also you can edit every single aspect of the Style like the buttons, checkboxes, scrollbars and so on. 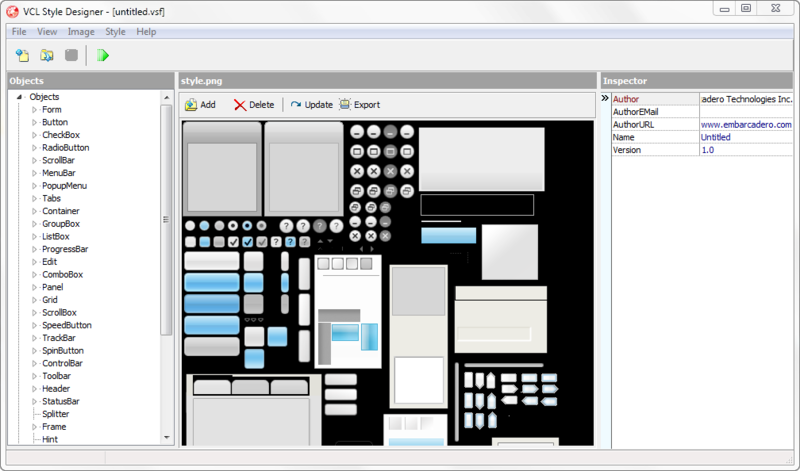 The Rad Studio XE2 only includes 5 predefined styles in the <Documents>\RAD Studio\9.0\Styles folder, But you can easily create your own styles using a predefined theme as template, check the next list of steps to create a New Style. 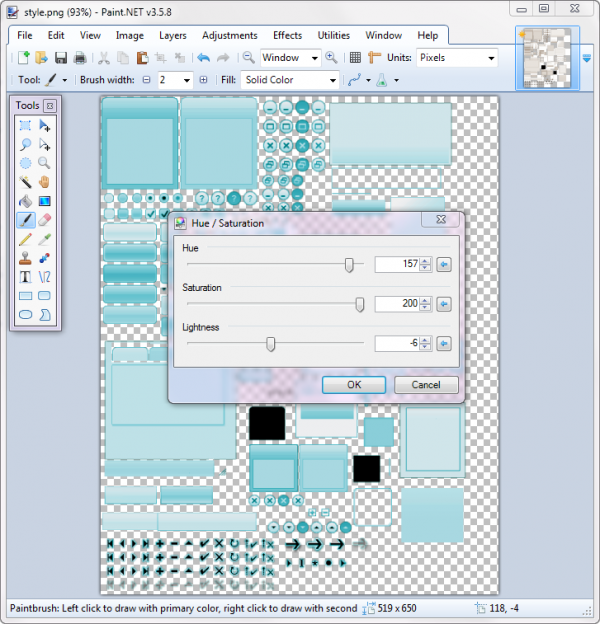 Then Load the Image in your prefered image editor and play a little, for example changing the hue and saturation of the image. Then go to the Style->Assign Colors option to let the application adjust the colors of the style according to the new image. Finally modify the name of the Style and use the option File->Save As to store your new creation. Following these simple steps in a few minutes I create a set of new styles ready to use. The posted images are missing. Only the sample style images at the end of the post are ok. I can set different styles for the same class of components? For example, in a TForm the buttons have a style in another TForm x and the y have a style buttons in the same application? Fabricio it seems a WordPress problem. Try refeshing the page. About your question as far I know you can only enable a VCL Style for all the application and not for a particular form or component. Rodrigo, refreshing the page did make the screen-shots visible. Sorry, It seems a WordPress problem. Hi Rodrigo, are those styles really OS version aware ? Or, in other words, will my application with these styles look always the same even if I will have e.g. classic Windows style selected ? And about the screenshots here; they are really missing now (404 — File not found). Yes, the VCL Styles works even if you have the classic Windows style selected. It seems that TStyleManager methods are static: you can call them without having to create an instance of the class. Nice article! And really nice and powerful feature! Thanks for this article. I liked the graphite styles, would be nice to combine the graphite style with the scroll bar and windows control (in right corner) shapes.The graphite shapes seem too builky. Thanks! very nice tutorial and styles. Do you know if there’s a way to have a top border with a different color in the page control tabs with this utility? But could you explain the difference between using TStyleManager. ans first creating one and the use it’s methods. Basically they’re static methods, so creating a stylemanager, doesn’t do anything extra beside creating a TStyleManager object. Or does the object has static and non-static methods? Ronald as explain in another comment, the source code posted is part of a larger project which includes a helper class to the TStyleManager object because this class does not have some basic funcionalities like unregister a loaded style and check if a style is already registered. 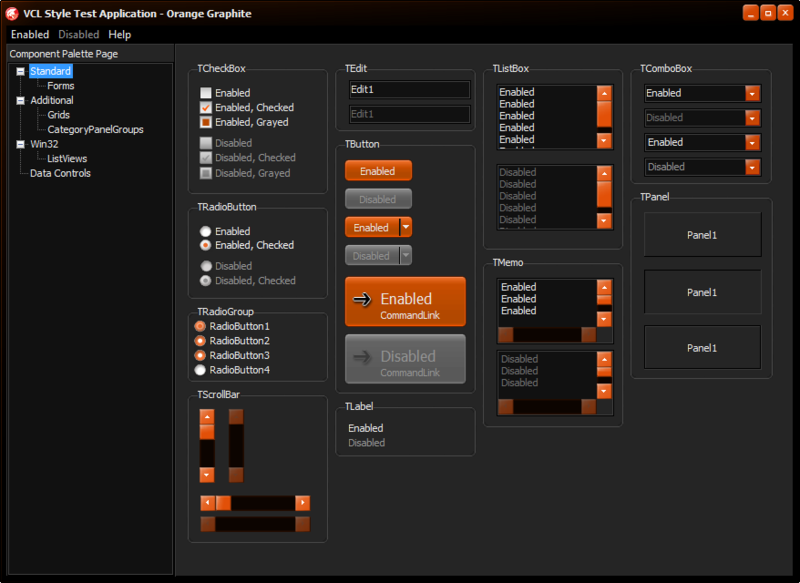 Anyway I just deleted the code which create the instances to the TStyleManager class to avoid confusion. I’d love a Mac OS X looking VCL style! What I am missing is the following: How to create/add an own style for a new/own created component (may sub classed from panel / group box), while I cannot create any additional style objects. You don’t need create a new style, instead you must make your control theme aware and use the StyleServices.GetElementDetails and StyleServices.DrawElement to paint your control. additionally depending of the complexity of your component you may need create a new StyleHook and register with the StyleEngine class constructor. Not sure if anyone has noticed, but upon exporting style.png and updating/importing it – all controls loose their anti-aliased look and other artifacts appear. 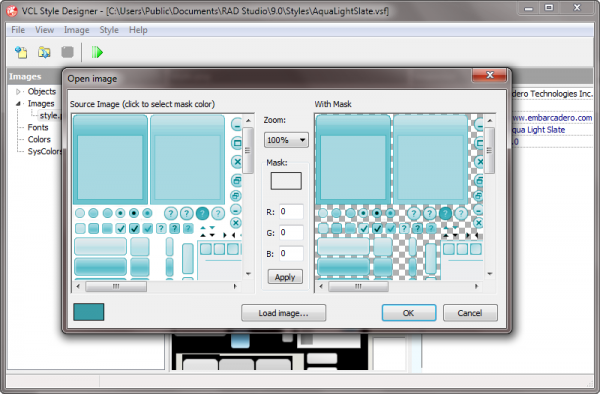 This occurs even if you do not alter style.png, just export and reimport it. You can see artifacts on the screenshots above, the groupboxes have little curved lines on the inner corners which shouldnt be there. All controls loose their ‘smooth’ look, and to me look ugly in comparison to a default style that hasnt been touched by the style designer. now if I enable styles he does not works. Anyone know how to change the color inside of the combo to a different style? You must create a customstyle hook, to modify the way of the control is drawn. the color of my label changed to Black but i want some of them be red or …! According to Embarcadero This is how the Styles feature is intended to work, you can get more info in this QC Report. Has anyone managed to get a style to load in a DLL? StyleServices.LoadFromFile(‘stylex.vsf’) works in exe but I get EcustomStyleException ‘Feature not supported by this style’ when loading the same one in a DLL. how i can create customstyle hook for label? The TLabel doesn’t have a Style hook beause is not a TWinControl, so the only way is override the paint method. Check the code of the TCustomlabel.Paint method to see how it works. 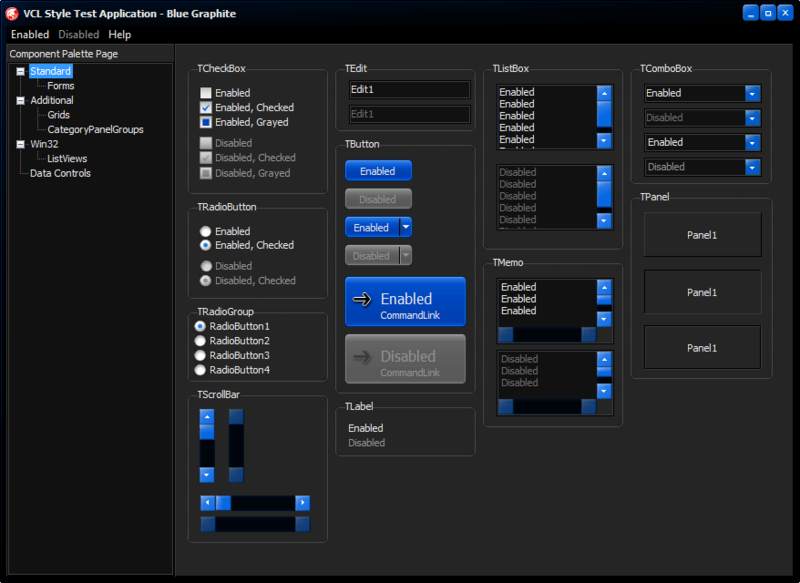 but i dont find Paint method in TCustomlabel class! Try asking this question in a forum like http://stackoverflow.com , in that way many people will benefit of the answer which you get. Nice info. I’m currently not using XE2 yet, but reading this has made me consider to use it. This is an beautiful article. Its hard work that gives birth to technological innovation. Keep up the good Delphi spirit! Great article. However, I could not find the specified path for XE3. 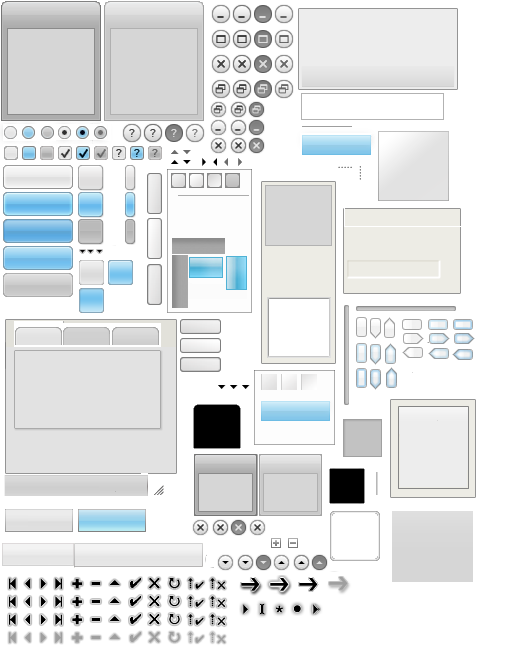 I found them in D:\Borland\Delphi XE3\Embarcadero\RAD Studio\10.0\Redist\styles\vcl\ (my folder area). Putting your XE2 .VSF styles in the download do not get found. Any solution? What do you mean with “I could not find the specified path for XE3”? What Howard means is that in XE3 the location for styles have been moved to a different directory (\Embarcadero\RAD Studio\10.0\Redist\styles\vcl\ instead of \Embarcadero\RAD Studio\9.0\styles\). The problem, which I am having too, is that no matter what I put in this directory in XE3 no custom styles will show up in the IDE. Yes. I should have closed this one off in February when I reread and put the VSF files in the Documents folder. I’m now happily populating my own subset with derived styles. Works like a charm, and I’ve also got run-time VSF file loading working with the application that was giving me all my problems. Great tutorial. It might be worth a note that at least as of XE4, they’ve renamed “VCL Style Designer” to “Bitmap Style Designer” and the EXE name is BitmapStyleDesigner.exe so if there’s no VclStyleDesigner.exe that’s why. Is it possible to restore/enable the shadows around windows while using styles? Hi Andrew, what do you mean with “shadows around windows”? can you post a sample image? Don’t see an option to include an image, however it’s simple enough to replicate. – Create a VCL Forms Application, build it, run it on Windows 7 Aero and you’ll see the shadows around Form1. – Change the project to use a VCL Style, build it, run it on Windows 7 with Aero and you’ll see there are no shadows. I’ve tried setting the WindowsClass with CS_DROPSHADOW, but that seems to have no effect. Do you try the answer of this question http://stackoverflow.com/questions/18324571/show-the-window-shadow-when-using-vcl-styles/18346275#18346275 ? Yes. 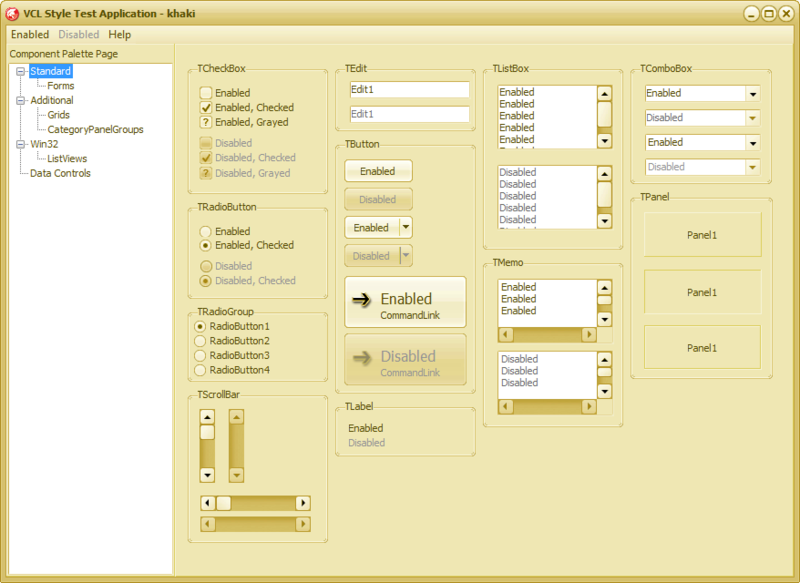 I have that in place at the moment, but it does not create the same shadow on Windows 7 as the form without the style. Plus, if a form is on top of another form, there is no shadow at all where they overlap. This whole thing comes about because of comments we are receiving from our customers that say the child and popup forms that our app generates are hard to distinguish from the main form, especially with certain styles, because of the lack of shadows. When I load a *.vsf file and apply the skin, is it possible to change some properties of components? I can’t sure whether other properties of components are changed. Sorry but I can’t help you with this issue :( , you must try on the DevExpress forums.